Our brand new SF6 gas analysis website is now live. The new website can be found at www.sf6.co.uk. In 2014 Cambridge Sensotec proudly manufactured the specialist Rapidox SF6 gas analysers for the gas-insulated electrical equipment market. A team of highly skilled and experienced engineers designed the analysers with the primary function of measuring the level of sulfur hexafluoride. Cambridge Sensotec SF6 6100 gas analysers are designed and manufactured to ISO 9001 standards and pre-programmed with all current IEC and CIGRE test configurations, with the ability to create customised test parameters. Our customer base for the SF6 6100 gas analysers consists of reputable organisations within the powergen and medical industries who report the analysers to be integral and fundamental in their SF6 gas analysis. 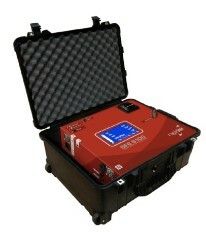 Available in the range is the Rapidox 6100 Pump Back, Portable and Bench gas analysers. 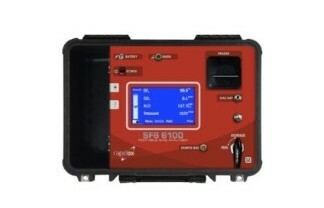 The Rapidox SF6 6100 Pump Back is a fully-automatic zero-emissions SF6 gas analyser, designed for controlling and monitoring the quality and purity of gas used in high voltage switchgear, circuit breakers and transformers. Exceptional accuracy and stability are provided when measuring the purity of SF6 gas, through specially selected sensors. The modular configuration allows for up to eight compatible gases to be analysed, simultaneously, using one analyser. The Rapidox is fully compatible with mixtures of SF6, CF4, N2 and air, together with toxic contamination gases such as SO2, HF, H2S and CO. Results are displayed on screen and printed using the inbuilt thermal printer. 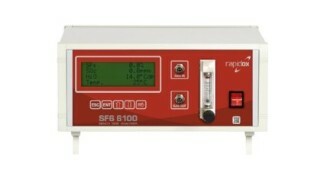 The Rapidox SF6 6100 Portable is designed for controlling and monitoring the quality of SF6 in medium and high voltage gas insulated electrical equipment. The modular configuration allows for up to eight compatible gases to be analysed, simultaneously, with one analyser. A gas output nozzle allows for the analyser to be attached to the Rapidox Gas Recovery Bag, ensuring that all sampled SF6 gas is recovered. Internal SF6 gas pressure is recorded and logged by the analyser. All measured gas is analysed and data logged simultaneously with only a few minutes required to achieve a stable reading. The Rapidox SF6 6100 Bench mountable gas analyser is designed for controlling and monitoring the quality of SF6 gas within a range of laboratory and field-based applications. These applications include medical testing, laboratory-based research and development, and the analysis of SF6 gas present in medium and high voltage gas insulated electrical equipment. SF6, SO2 and H2O (dew point) gases are simultaneously analysed and data logged to an exceptionally accurate standard. The Rapidox SF6 6100 Bench analyser is also available as a complete and portable kit, allowing users to carry all the equipment they require within a heavy-duty IP66 case. Each kit includes a set of DN8 and DN20 fittings with a stainless-steel braided hose (self-sealing couplings), a swing handle fitted to the analyser and a separate thermal printer. For any further information please visit the new SF6 website, email sales@sf6.co.uk or call +44 (0)1480 462142. Alternatively, please use the LiveChat functionality on the website where Cambridge Sensotec can provide real-time answers to enquiries. November 12, 2018 in SF6.